Plants annual or perennial; habit various. Culms 3-800 cm, not woody, sometimes branching above the base; internodes solid or hollow. Ligules membranous and ciliate, or of hairs, rarely completely membranous; blades sometimes pseudopetiolate. Inflorescences spicate panicles with highly reduced branches termed fascicles; panicles 1-many per plant, terminal on the culms or on both the culms and the secondary branches, or terminal and axillary, or only axillary, usually completely exposed at maturity; rachises usually terete, with (1)5-many fascicles; fascicle axes 0.2-7.5(28) mm, with (1)3-130+ bristles and 1-12 spikelets. Bristles free or fused at the base, disarticulating with the spikelets at maturity; of 3 kinds, outer, inner, and primary, in some species with all 3 kinds present below each spikelet, in others 1 or more kinds missing from some or all of the spikelets; outer (lower) bristles antrorsely scabrous, terete; inner (upper) bristles antrorsely scabrous or long-ciliate, usually flatter and wider than the outer bristles; primary (terminal) bristles located immediately below the spikelets, solitary, antrorsely scabrous or long-ciliate, often longer than the other bristles associated with the spikelet; disarticulation usually at the base of the fascicles, sometimes also beneath the upper florets. Spikelets with 2 florets; lower glumes absent or present, 0-5-veined; upper glumes longer, 0-11-veined; lower florets sterile or staminate; lower lemmas usually as long as the spikelets, membranous, 3-15-veined, margins usually glabrous; lower paleas present or absent; upper lemmas membranous to coriaceous, 5-12-veined; upper paleas shorter than the lemmas but similar in texture; lodicules 0 or 2, glabrous; anthers 3, if present. x = 5, 7, 8, 9 (usually 9). Name from the Latin penna, feather, and seta, bristle, an allusion to the plumose bristles of some species. 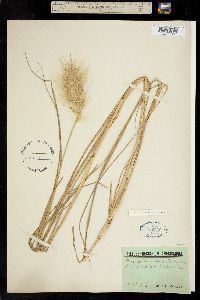 Spikelets with a single perfect terminal fl and a lateral fl represented only by a thin, sterile, glume-like lemma; first glume short or wanting; second glume about as long as the sterile lemma; fertile lemma chartaceous, narrowly lanceolate, awnless; panicles dense, spike-like, with short-pediceled, involucrate groups of 1-few spikelets, the group and its invol falling together, the invol of several-many distinct or basally connate, often plumose bristles (short sterile branches). 100+, warm Old World.